The explosion of voice, video, and data anywhere and anytime means that network service providers need constant availability and performance from their fiber optic network. The ability to provide quad/triple play and passive optical network (PON) architectures with optical splitters has made fiber monitoring an even bigger challenge. 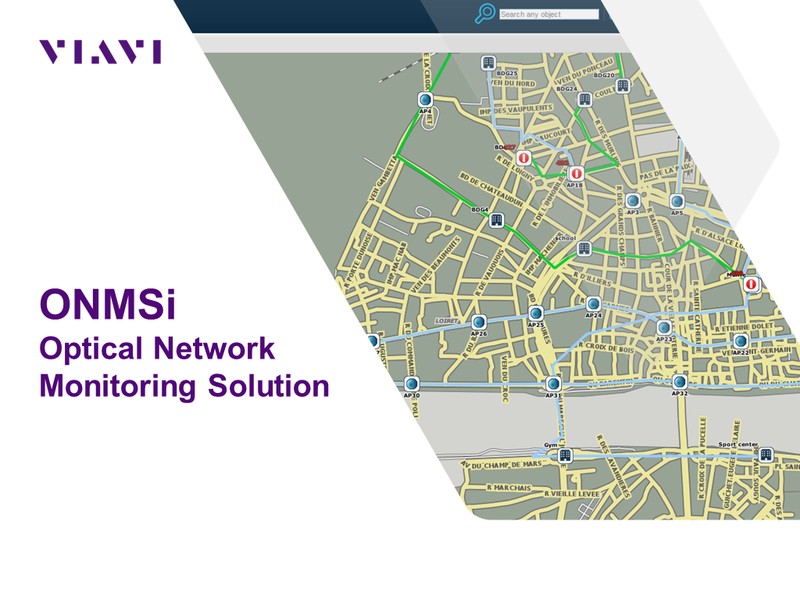 The Viavi SolutionsTM ONMSi is an optical network monitoring system that expands network visibility right from the core across the PON and into the premises—improving operational support and quality-of-service (QoS) for any type of network. 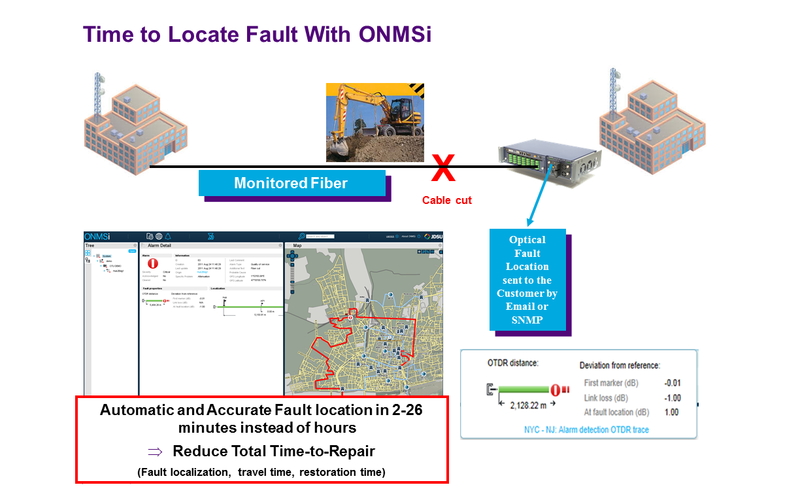 ONMSi is a remote fiber test system that scans the fiber network 24/7 and automatically detects and locates faults without having to dispatch technicians in the field. 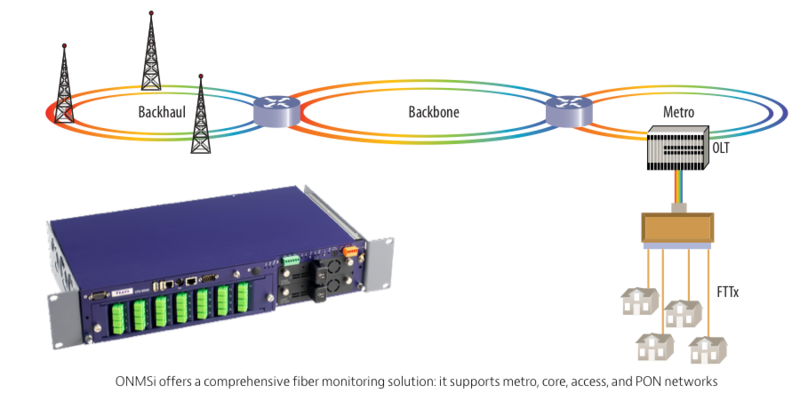 Based on industry-leading Viavi optical technologies, an OTU integrating an optical time domain reflectometer (OTDR) and an optical switch constantly compares data to a baseline and sends alarms if any fiber degradation occurs. 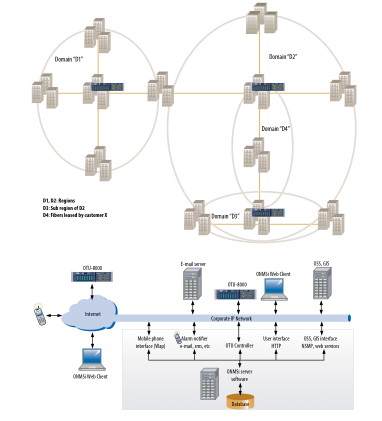 Using the same software and hardware, ONMSi is perfectly adapted for P2P or P2MP networks. 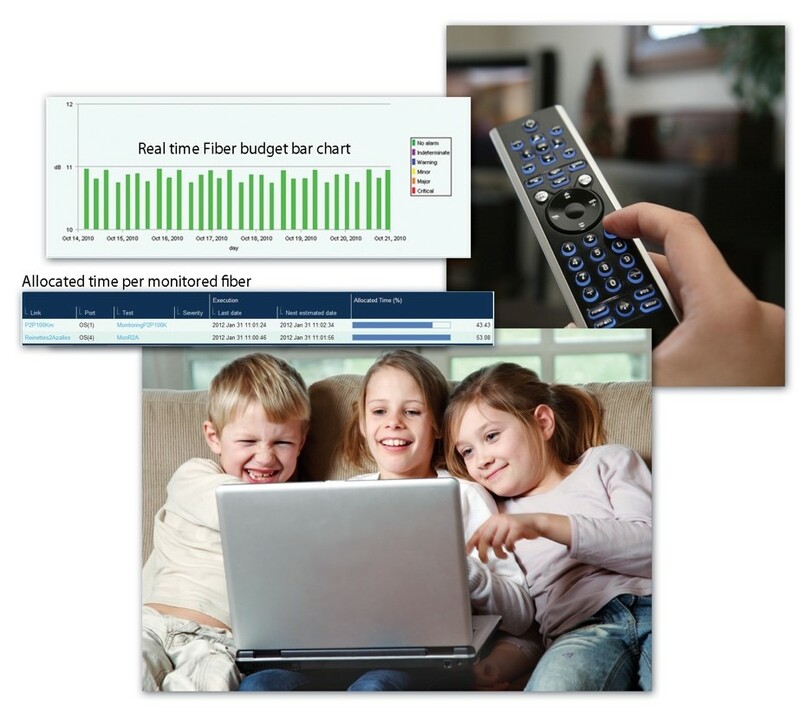 The system can be easily configured by the user for a long-distance metro/core test or for a short-distance PON, extending the fiber visibility of the network operations center (NOC) up to the FTTH subscriber. Whatever fiber monitoring application (for example, fast fault location, accurate location of small fiber changes, quick set up) you are targeting, ONMSi fits your needs. For example, fiber-test setup can be done with one click by a non-OTDR-expert for a standard configuration, or a fiber optic master can address advanced applications with the multiple possibilities offered by ONMSi for test configurations. The ONMSi OTU-8000 is a compact, 2U-high, rack-mounted unit housing both the OTDR and optical switch modules. A single OTU-8000 can house up to two OTDRs and up to 48 optical switch ports. Capacities of more than 1000 switching ports are achieved by adding multiple external switch units (1U high, 36 ports each). Intelligently managing power distribution between optical switches typically consumes 35 W independently from the number of external switches. Installed in unmanned sites, the OTU-8000 uses dual power supply feeds and solid-state memory (no magnetic hard disk) for unprecedented reliability. It ensures that alarms will notify operators if the primary communication channel fails and will switch automatically to a backup channel. If communication cannot be established with the ONMSi server, the OTU-8000 will notify users by e-mail or SMS. With its multiple test capabilities, the OTU-8000 can accurately locate a fault within a span of 200 km or test 32 fibers in less than 1 minute. This versatility lets it fit applications where slow fiber degradation is researched. And, it quickly detects intrusion that threatens network integrity. To address different organizations, the ONMSi data model is based on domains. The user can create a collection of ONMSi objects such as OTU, P2P network, PON, fiber link, fiber section and subdomains. The same object can belong to more than one domain. User permissions can be created per domain. For example, a top-down regional organization may use regional domains whereas a dark-fiber provider may use customer or link domains. Large field-service maintenance teams can create privileges so that users can access all the OTUs existing in a network. With complex IT environments, integrating a test system is often a key success factor for a project. 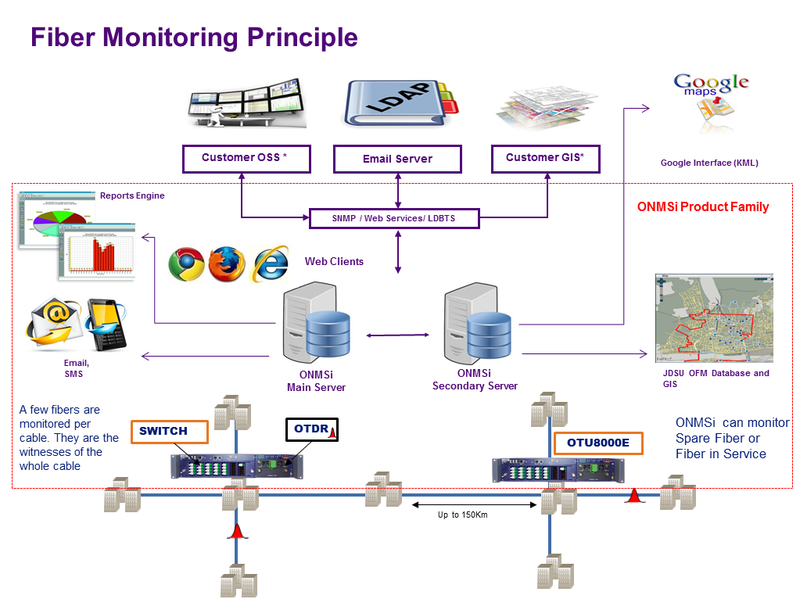 ONMSi can be provided with two different interfaces: SNMP and web services (XML over HTTP). This flexibility ensures integration with OSS, GIS, and other IT back-office systems. ONMSi alarm management is also compliant with OSS-J initiatives and ITU-X733.